We’ve just created a Free Version of EZ Numbers. You need the paid versions to really understand your business in depth, get a loan, or get an investment. We’ve had a lot of users tell us that until they used EZ, they hadn’t really understood their business. But if you just want to test out a rough business idea, the Free Version might be all you need. 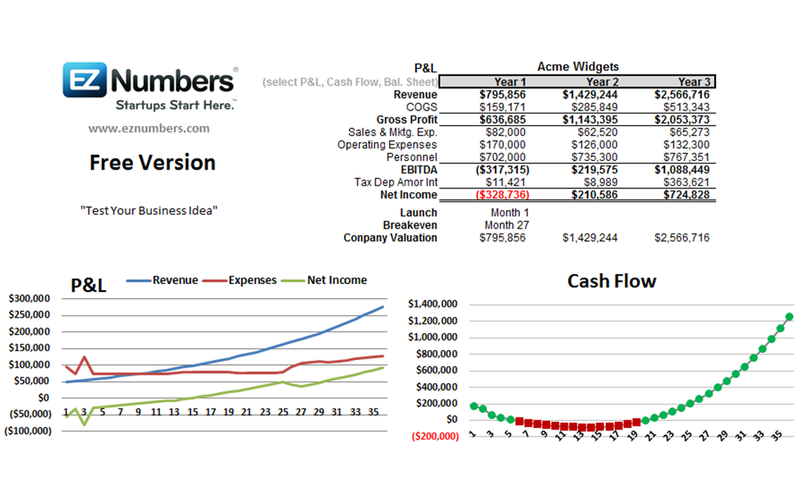 It is a fully functional pro forma template for your startup projections. Enter your Capital Expenditures, Sales & Marketing and Operating Expenses, Personnel, Sales, Loans, and Investment, and you’ll instantly get your P&L, Cash Flow, and Balance Sheet. Note: The Free Version is not the same as the paid versions. It’s completely different code. So it’s not designed to be an evaluation for the paid versions, which have far more functionality. It will only take you a few minutes to see how your business idea pans out – and then make as many changes as you like and see how they affect your bottom line profit and cash flow. To get your copy, just e-mail us at info@eznumbers.com.